Universal Pictures has released the first trailer for Oscar-winning Forrest Gump and Back to the Future filmmaker Robert Zemeckis’ new film Welcome to Marwen. 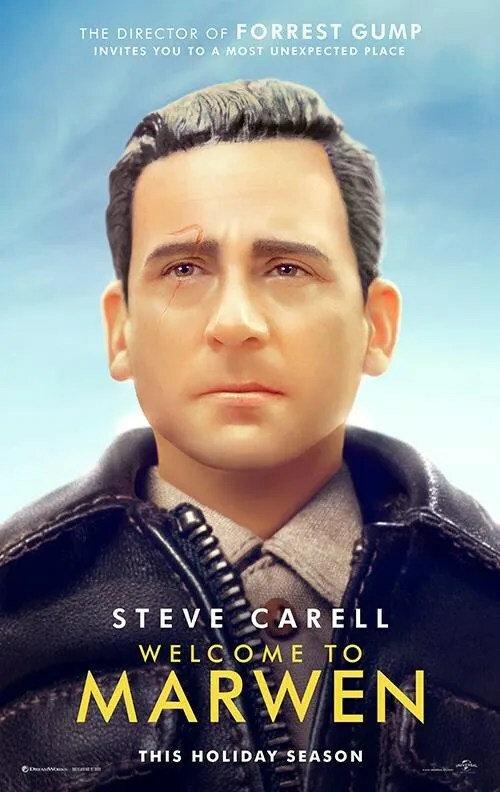 Based on the documentary Marwencol by Jeff Malmberg, the film stars Steve Carell as a man who loses most of his memory after being beaten nearly to death. Unable to afford therapy, he begins building a 1/6-scale World War II-era Belgian town in his yard, populating it with dolls that represent himself, his friends, and even his attackers. That sounds like a bittersweet tale along the lines of Forrest Gump, but as this first trailer shows, Zemeckis is going all-out for mo-cap craziness. For me, and likely a very specific subset of moviegoing folks who aren’t scared off by the Uncanny Valley, love stop-motion-esque animation, and have spent far too much time with action figures as coping mechanisms, Welcome to Marwen hits a weirdly specific and unsatisfied niche. The only knock I have against it at the moment is Universal’s marketing department opting to boil the entirety of the film down into a two-and-a-half minute trailer rather than teasing the picture’s obvious oddities. Zemeckis co-wrote the screenplay with Caroline Thompson, who previously wrote films like Edward Scissorhands and The Nightmare Before Christmas. Malmberg serves as an executive producer on the project, which is Zemeckis’ second film in two years after last year’s World War II romance/thriller Allied. Check out the Welcome to Marwen trailer below. The film also stars Leslie Mann, Merritt Wever, Eiza González, Gwendolyn Christie, Janelle Monáe, Leslie Zemeckis, Diane Kruger, and Neil Jackson. Welcome to Marwen opens in theaters on November 21st. Academy Award®-winning filmmaker Robert Zemeckis (Forrest Gump, Flight, Cast Away) directs Steve Carell in the moving true story of one broken man’s fight as he discovers how artistic imagination can restore the human spirit. The screenplay for Welcome to Marwen was written by Caroline Thompson and Zemeckis, while Oscar®-winning producer Steve Starkey (Forrest Gump, Flight), Jack Rapke (Cast Away, Flight), and Cherylanne Martin (The Pacific, Flight) of Zemeckis’ Universal-based ImageMovers banner produce alongside the director. It is executive produced by Jackie Levine, as well as Jeff Malmberg, who directed the riveting 2010 documentary upon which this film is based.